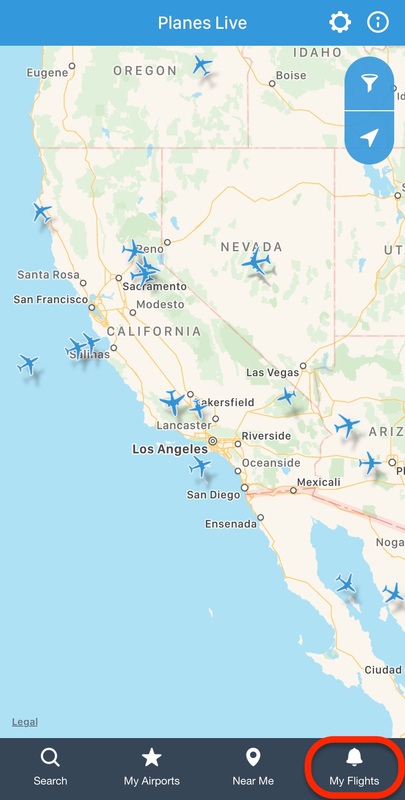 When browsing on the map or checking flights in search, airport please tap on the flight - this will open Flight Information tab where you can consult aircraft type, airline, flight number, check trip duration, departure and arrival details, weather conditions for both locations, etc. Swipe up to see more information. As soon as there is any flight news (new arrival time, actual departure time, etc.) issued it will appear under Updates section of the Flight Information tab. Geoposition section at the bottom of the flight details tab will provide information on the plane’s actual location and heading. Tap the green Follow button in order to receive notifications on the flight updates. Select date of the flight (to track a specific flight) or activate Always Inform option (to receive notifications about every flight made with this flight number). For more details on following flights please check the guide on how to track flights. The flights that you follow can later be easily accessed from the app’s main screen by tapping My Flights in the bottom right corner. It is also possible to check flight path of the selected flight. For this please tap Flight Path at the bottom of the Flight Information tab - you will be transferred to the map. The grey line indicates the flight path with the red plane symbol showing the flight's actual position. Swipe up the information card at the bottom of the screen in order to get back to the Flight Information tab. To check the actual location of the flight please tap Track at the bottom of the Flight Information tab. The red plane symbol indicates the flight's actual position. Zoom the map in or out to see more details about the location. In case you have questions or suggestions on Planes live application - don't hesitate to contact us via support@apalon.com. Thank you in advance!